Learn About Solar | Solar Batteries | Should You Install Solar Batteries for Home Use? Energy storage technology has been around for decades, but solar batteries used in home solar-plus-storage systems are relatively new to the market. While solar batteries can offer a significant economic benefit for homeowners in certain situations, their price tag means they don’t make financial sense for everybody. Read on for our rundown on what solar batteries can and can’t do for your home. Whether or not you’ll save more money by installing a solar-plus-storage system depends how your electric utility charges its customers. In states with net metering, you will typically receive a credit on your utility bill for every kilowatt-hour (kWh) of solar energy that you send back to the grid. You can use those credits later on when you need more electricity than your solar panels are generating. For homeowners in this situation, installing a solar battery won’t increase their savings: the electric grid is providing the same financial benefit as a solar battery. However, some electric utilities are changing their rates in ways that make solar batteries a smart investment for homeowners. If your utility’s rate policy includes any of the following, energy storage can help you save more with your solar panels. If your utility has TOU rates, the per-kWh rate that you pay for electricity will change depending on the time of day. Electricity will cost more during “peak hours” when demand for electricity is high, typically in the late afternoon and evening. Electricity rates are lower during the daytime when home electricity use is lower and solar panels are at their most productive. 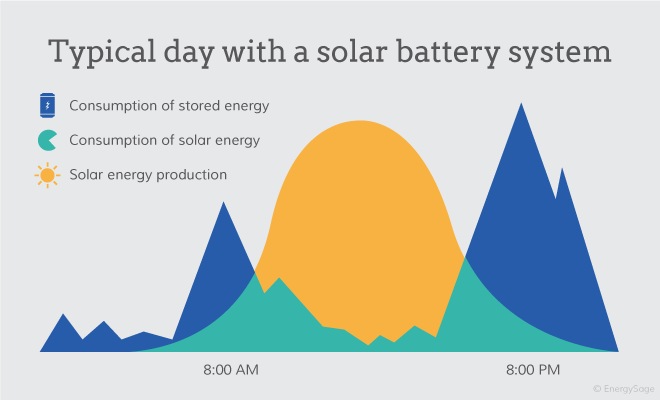 If your utility uses TOU rates, you can benefit from home energy storage by using electricity from your solar batteries during peak hours when utility electricity rates are at their highest. TOU rates are becoming more common in the U.S., with California leading the way. Under a new solar policy, any homeowner who installs solar panels in the Golden State will automatically be required to pay TOU rates instead of a single per-kWh rate. If your utility has demand charges for residential customers, you’ll be charged a fee that changes depending on how much electricity you use. The fee might depend on how much electricity you buy during peak hours when electricity demand is the highest. It may also be determined by the total amount of electricity you use in a month. 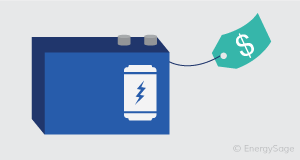 If your utility uses demand charges, you will benefit from solar batteries because you may be able to avoid a higher fee by relying on your energy storage system instead. While demand charges are more common for commercial customers with big electricity bills, some states and utilities are considering the addition of demand charges to their electricity rates to motivate people to reduce their electricity use. Utilities in Arizona and Illinois, among others, are evaluating residential demand charges. In states with true net metering, you’ll receive a per-kWh credit equal to the cost of electricity on your bill for the energy your solar panels produce. For example: if you pay $0.11 per kWh for electricity from your utility, you’ll get a $0.11 credit on your bill for every kWh of solar energy that your panels produce and send back to the grid. However, in certain states, you will receive a credit for the wholesale or “avoided cost” rate, which is usually equal to the rate your utility would have paid to buy the electricity somewhere else. As a result, the monetary value of one kWh of solar power that you use at home is higher than one that you send back to the grid. As an example, if you pay $0.11 per kWh for electricity from your utility but your utility only offers a $0.04 credit for electricity sent back to the grid, your solar electricity will be worth $0.07 less if you don’t use it at home. In these states, installing solar batteries makes economic sense because you’re able to maximize the value of the energy you generate at your own property. At the end of 2015, the Nevada Public Utilities Commission (PUC) voted to change its net metering policy to a policy based on the avoided cost rate – one of the first states to make such a change. In Hawaii, where more than 10 percent of homes have rooftop solar, the PUC has also reduced net metering credits in a way that makes energy storage a worthwhile investment. Solar batteries still cost more than a standard diesel generator, but they can provide backup power without producing greenhouse gas emissions. If you have a standard solar panel system, you’ll still lose power during a power outage because of how your panels are connected to the electric grid. However, when you add a battery to your system, your home can run off of the solar energy you have stored in the event that the grid goes down. As energy storage technologies come onto the market, more homeowners are thinking about going "off the grid" – completely severing their connection to their electric utility – with the use of solar batteries. While there are certain situations where going off the grid is possible (or even necessary), most solar batteries aren’t designed to serve as your only source of power. They provide more value for the average homeowner when they are connected to the electric grid, and should be thought of as a solar grid storage product. Your solar panels will produce more electricity during the long days of summer than they will in the winter months. To go completely off the grid, you will need a battery system that can store significant amounts of extra energy in the summer months so that you can meet your electricity needs in the winter. A typical home solar battery like the Tesla Powerwall isn’t nearly large enough to do that – most of the products available today are designed to provide just a few hours of energy so that you can maximize your hour-by-hour solar electricity use. Because most home solar batteries on the market only have enough capacity for a few hours of electricity, a single battery can’t run a standard American home for multiple days. However, they can provide you with temporary backup power. They can also be calibrated so that they only power essentials in the event of a blackout, which can extend their usefulness. If you truly want to go completely off grid, you should be prepared to spend tens of thousands of dollars and set aside a section of your home or garage for a large multi-battery energy storage system. Can I go "off the grid" with solar batteries?